During winter, a lot of people in the States complain about gaining weight. Those that rely on jogging is their form of exercise can't do it during this time due to the weather condition. We have a mini gym in our home so working out can still be done at the basement where our bow flex, tread mill and weights are. We also see to it that we play outside once in a while. The picture of my husband and daughter below was taken last year in front of my father in law's house where we used the wooden sled. When the temperature drops and the snow begins to fall outside, it's hard to justify a good reason for getting off the couch. But even though lounging in front of the television feels a lot more tempting than taking a jog or even driving to the gym, there's no reason you have to completely surrender your fitness goals until spring. 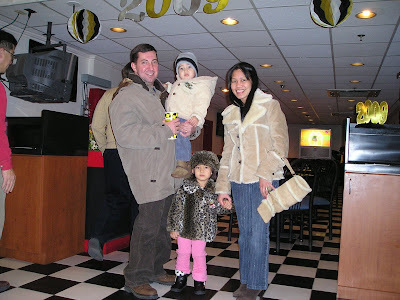 We celebrated our new year by dining out at Duffy's. We did not attend the party that the base hosted for the parents simply because we want our new year to start of us being together. The prizes at the party which included a trip for two to China were tempting but family is priceless! After dinner, we came home and watched a movie while waiting for the time to start the new beginning... new hope..... and new opportunities for us to explore the beauty of God's creation. 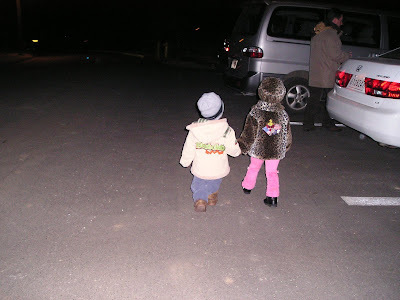 Here's our beloved children, going to the car following Daddy. 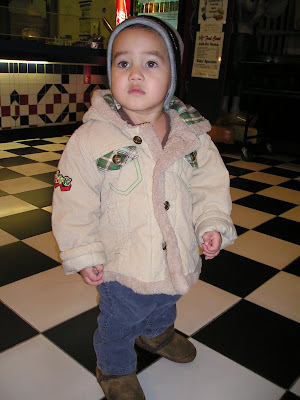 here's EJ inside Duffy's while waiting for our food... How about you guys, how did you celebrate yours? Did you do something especial?